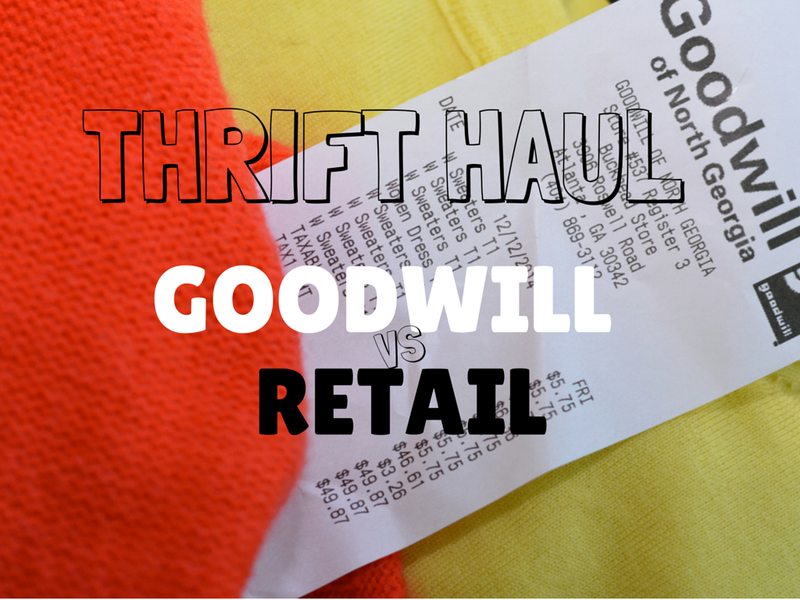 I'm really excited about this this thrift haul! It includes some of my favorite brands plus some new discoveries. The retail value is over $900. My price at Goodwill? Only $50. I am not a label whore. I look at quality first. I judge by how the fabric feels in my hands or on my body then move on to fit and brand. I was really shocked by the retail prices of some of these pieces. While researching prices, I found quite a few major sales along the way so I'm including affiliate links to items should anything catch your eye. Sale prices aren't as low as thrift but they are pretty dang reasonable (and brand new)! This is my favorite from the haul. 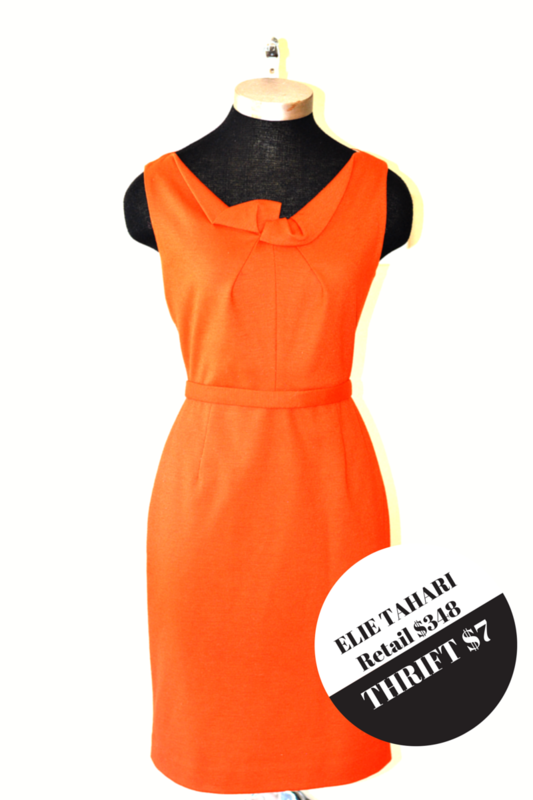 This dress looks amazing on me and it's orange! It doesn't fit my lifestyle but it's a classic and I'm sure to get some wear out of it. It would make a good holiday dinner party dress so if you're local consider this my subtle request for an invite. Like most items in this haul, it's no longer available but I did find a $96 sale price sheath with an bow detail on the neckline. It's also from Nordy's where the shipping is free! The sweaters are all my second favorites. My closet is always lacking in this area. I managed to find 5 very nice ones. Another orange find! It's from last year's holiday collection so it's not available anymore. 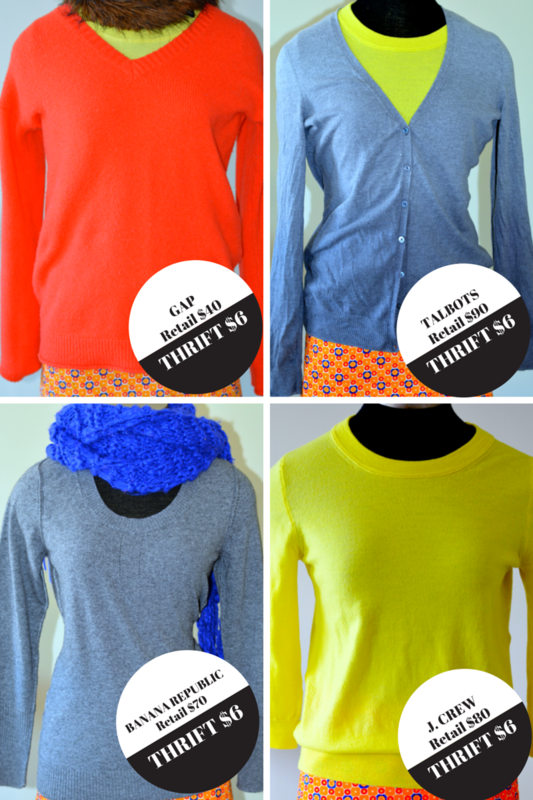 Current v-necks on the Gap site are $40. Some are marked down to $30. If you buy 2 items, you save 30%. Buy 3 items, save 40%. Buy 4+ items, save 50% with code GIFT. 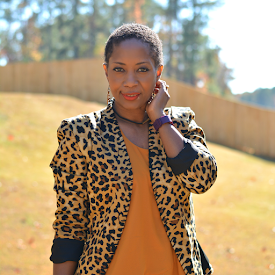 Talbots is one of those brands that I love and the quality is worth the price. Most of the time. This sweater is a cotton blend. Well made but pretty standard. The ombre is a nice touch but $90 is way too much for a simple cardigan. Currently the entire Talbots site is 40% on $70 or more which isn't too bad. A better price can probably be found on the clearance rack in store though. I have a thing for grey. It's black without actually being black. I liked the exposed seams and it's petite sized so it fits my arms. Always a winner in my book. Everything is 40% off on the BR site with code BRMERRY40. Since this is a cashmere blend, I'd be ok with $42. Banana Republic is on my good quality list. I love J. Crew. I would buy at any cost if I had extra funds. I don't so finding this neon colored cutie at the thrift is a true score. This very sweater is still available on the J. Crew website. 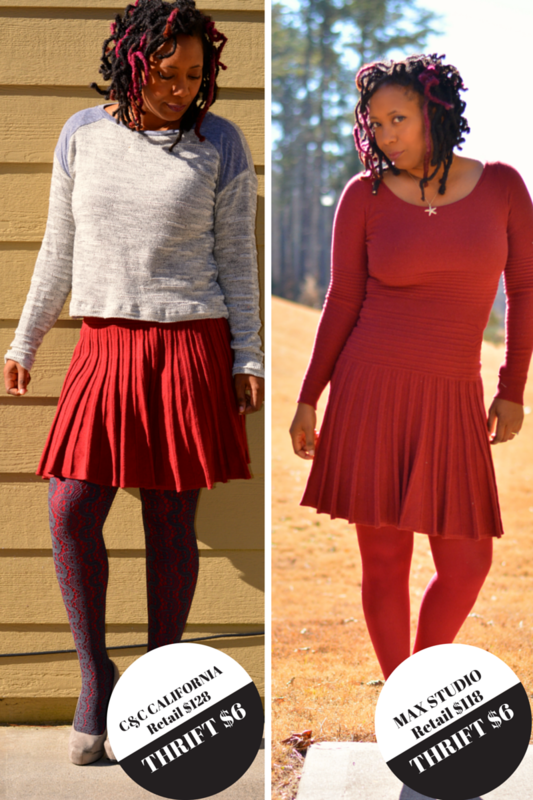 40% of winter styles with code JINGLE. I found this one in the dressing room. It looked big and shapeless when I picked it up. I tried it on anyway because I'm a tunic fan. The cut worked really well. When researching the price, I discovered they retail in the $100 range. Huh? Every piece on Amazon is marked down to $20 - $30 plus free shipping through prime. That's a price I'm comfortable with. I didn't find anything close to this style on Amazon. There's a similar style at Last Call Neiman Marcus that's $50. It's cuter than mine. I chose this sweater for the super soft loose weave. I had no idea this was such a costly brand. I've heard of C& C California but still no clue that a little cropped sweater could be so much. Lowest price I could find was $40 at 6pm.com. This is another one with a great fit. It's a nice winter day dress and I don't have too many of those in my closet. After visiting the Max Studio website, I am a fan. 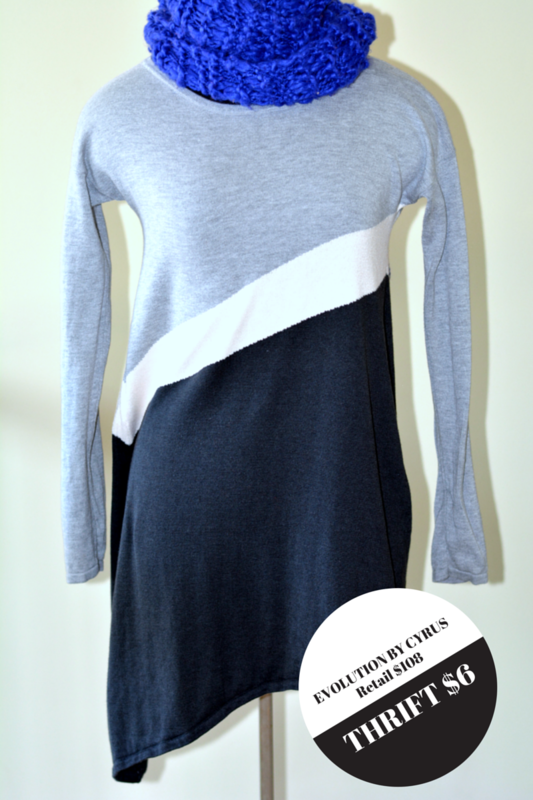 The dresses are very figure flattering and lots of yummy knits! I found a dress similar to this one that's sale priced at $40 on Nordstrom Rack. My thrift haul is complete. I feel good about finding so many of the brands I love and discovering some new labels along the way. Goodwill prices are higher than I normally like to go but way better than retail and a little bit better than those sale prices. What brands are you crushing on? Have you found them in a thrift store?